It’s Almost July of this year. What’s so special in July, you may ask. Naaa.. It’s not my birthday and it’s not my son’s birthday. This is the time I have to shell out a huge chunk of money for my car insurance. Year after Year, each year. Now if I am so much worried about my Car’s insurance premium, Imagine about the ship owners. Imagine how much money they need to pay for the insurance of their ships. But that is the cost they cannot avoid. These costs are for the insurance of ship’s hull and machinery. The good part in this insurance is that costs are known to the shipowner and they can plan for that. But when a ship is navigating at sea, carrying cargo and is involved in all these activities, it is subjecting itself to a number of claims against the ship owners. For example, a port can claim that ship damaged its fenders or a buoy while berthing. 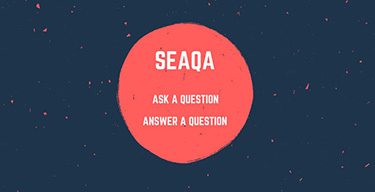 Or the port can claim that ship polluted their waters. So it is not about only insurance of damage to the hull and its machinery but also about all the claims that ship owner can get against him. There can be a number of other kinds of claims. Some logical and some illogical. But ship owners have to make sure that they are insured for all of these. 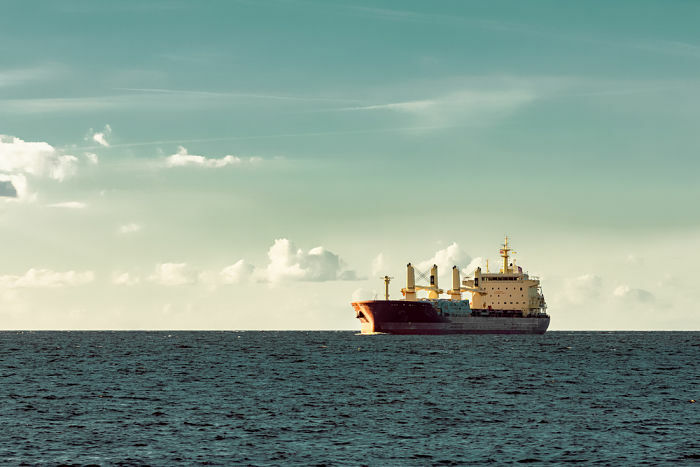 In this post, we will discuss where P&I clubs fit in the marine insurance and how do these work. 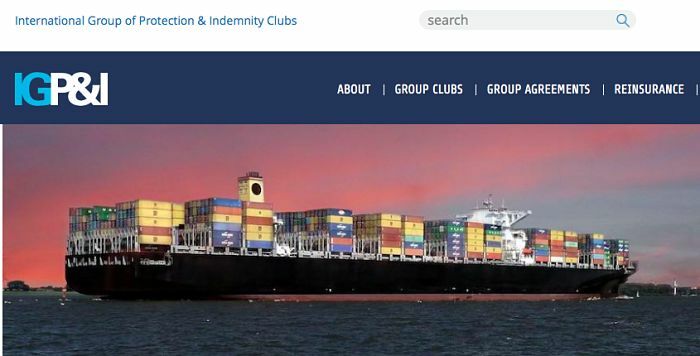 Where do P&I clubs fit in marine insurance? 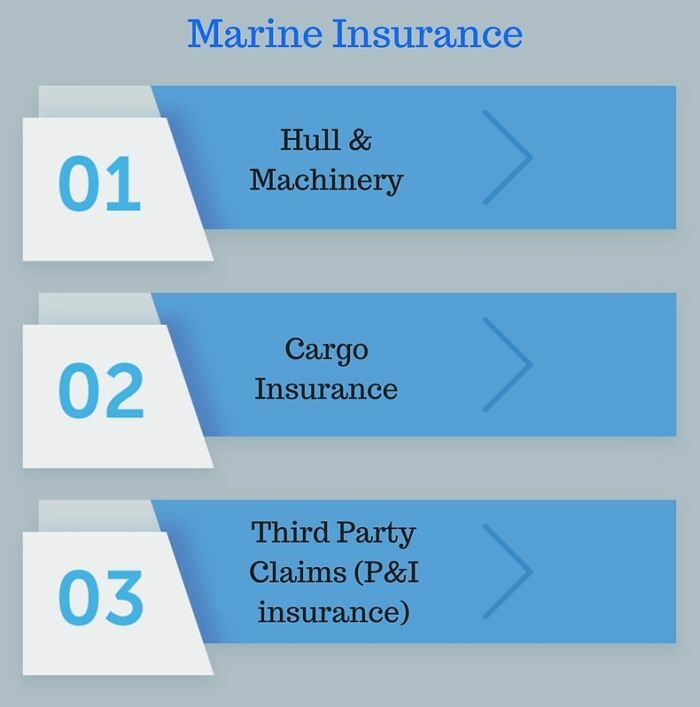 Broadly there are three types of marine insurance. Insurance for the ship’s hull and machinery is provided by H&M underwriters. This is the oldest kind of marine insurance and most basic one too. This is the insurance for the damage to the ship’s hull and machinery. H&M insurance policies have few important clauses that shipowners have to abide by. For example, H&M policy has International Navigation Limits. 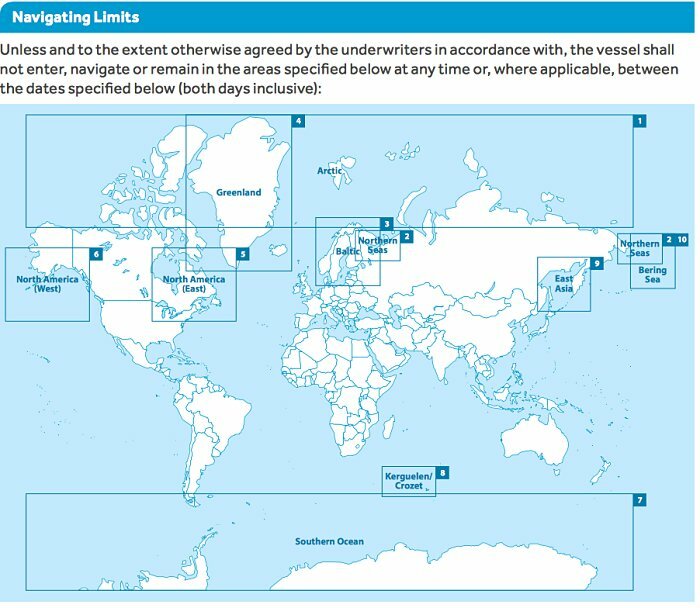 The international navigation limits define the geographical limits within which the ships can trade without any additional premium. Another example, H&M policy restricts the ship to proceed to war zones without informing the H&M underwriters. Again, this is because of additional risk that these areas pose. The shipper has shipped the cargo and the cargo gets damaged during the voyage. 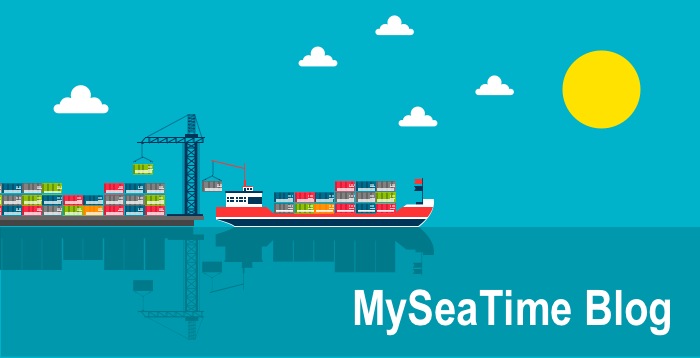 Can shipper claim all the costs from the shipowner or carrier? If you understand the “Hague-Visby rules” you will know that these rules provide many defenses to the shipowner. So if these defenses apply to a case, the shipper would have nobody to claim these damages from. This is the reason that shipper insures the cargo at each leg of the voyage. P&I insurance is used for the third party claims towards the ship owners. Shipowners provide a service of carrying the cargo of the shipper. While providing this service, a shipowner may be subjected to a number of claims from third parties. These claims could be damage to the jetty, pollution from the ship or even the fines to the ship from authorities. Shipowners need to insure for all these third party claims. 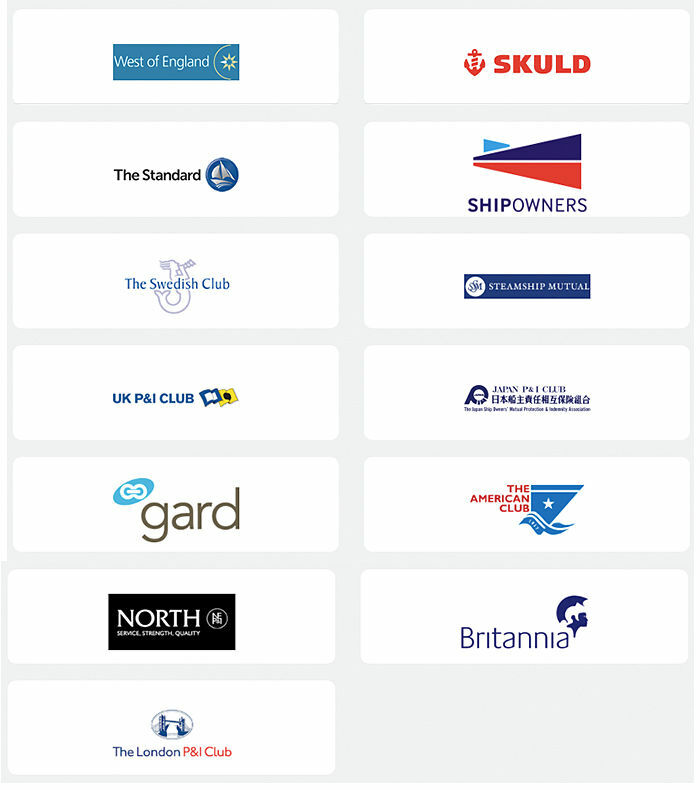 P&I clubs provide insurance to the shipowners for all these claims. Before the 19th century, the term “marine insurance” only meant the insurance for the ship’s hull and machinery. This was the time when most of the ships were sailing vessels. The chances of collision between two sailing vessel’s were less. But as more and more steamships came to the sea, the chances of collision between ships increased. Underwriters became concerned about this increased risk. Rightly so because in collisions between two vessels, H&M insurers not only have to cover the damages of the insured ship but also pay for the damages of the other ship if the blame is on the insured vessel. To take care of part of this risk, they introduced a clause in their policies. This clause was called “3/4th Collision Clause” or “Running down clause“. 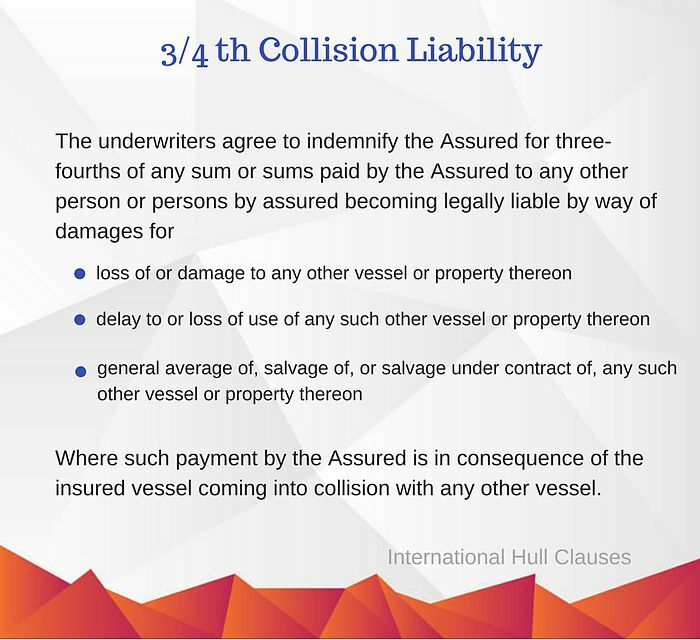 As per this clause, the underwriters will only pay 3/4th of the total liability or claims against the ship owners in a collision incident. This clause is there in the Hull & Machinery policies even today. Let us see this with an example. Let us say there has been a collision between two ships. The “hull & machinery insurance” of both the ships will study the investigation of the collision to set up the percentage of blame. So ship A need to pay USD 145,000 to ship B apart from USD 100,000 damages to its own ship which will be covered by H&M insurance. As per 3/4th collision clause, the H&M insurance company will pay only 3/4th of this amount. The ship owners wanted to insure this amount too without exorbitantly increasing their insurance premium. Shipowners could get this 1/4th liability insured but for that, they needed to pay an additional premium. Shipowners wanted to avoid that. This led to the formation of P&I clubs which works on the principle of mutual sharing or pooling of the risk. With time the P&I clubs insured many other risks the owners were subjected to in their business of running the ships. How do the P&I clubs work? P&I clubs work on a non-profit basis. It is the club of shipowners who are acting both as assured and insurers. P&I clubs work on the principle of mutual sharing and pooling of the risk. What does this mean? Let us understand this with a simple and most basic example. 10 shipowners form a club for sharing each other’s risk. All these 10 shipowners have one ship each which is of the same type, size and value. At the end of the year, one ship had third party claim of USD 1000 to pay. This claim of USD 1000 will be shared by all the 10 shipowners equally. So each shipowner would contribute USD 100 to pay this claim. This means that with just USD 100, each shipowner was able to cover the risk of the third party claims. Now that we know the basic principle of working of P&I clubs, let us understand few basic terms used in P&I clubs. In more realistic situation P&I club cannot afford to ask the contribution of each owner only when there are some claims to settle. In our example, the claim of USD 1000 would need to be paid immediately to avoid the delays to the ship. This means that P&I club needs to have money in its account to pay for the third party claims. when the fund money goes down because of the claims settles. All these requests to the shipowners for the payment are called “Calls”. Deductibles in a claim is a common practice in all kind of insurances. The deductible is the pre-set amount deducted from the insured loss. Let us say that a P&I club has set the deductibles for claims arising from damage to the jetty as USD 5000. Now if the claim towards the shipowners for one of such incident is USD 30000. 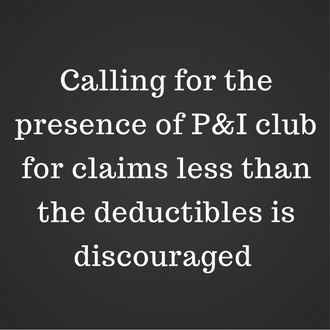 Then the P&I club would pay USD 25000 after USD 5000 as deductible from this claim. It discourages the shipowners from claiming the small amounts. Now let us see this from the perspective of a ship owner who just bought a ship and needs to enter a P&I club. It is important for the shipowner to insure all risk involved with the operation of a ship. 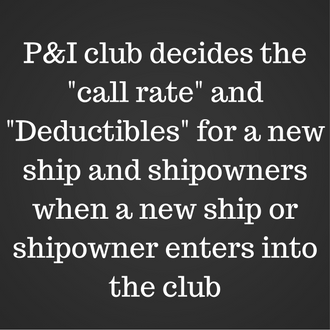 Apart from “Hull & Machinery” insurance, entry of the ship into a P&I club is important. So the ship owner would first approach the P&I club for including him and his ship into the club. Once the club decides that the ship can be covered, the details of the cover provided by the club would be shared with the ship owner. The details would include the call rate and deductibles for each type of risk. Call rate is expressed as amount per gross tonnage. If agreed the ship owner will pay the “advance call” and P&I club will issue the “certificate of entry” to the ship owner. Let us see how the finances of a P&I club are handled? As discussed, the P&I Club maintains a fixed amount of fund which is used for the settlement of claims. The P&I Club maintains this fund through the payments of the advance calls and supplementary calls from the members. Some part of this money is also invested to earn some profit which again goes into the fund. This all becomes the income part of the P&I club. The Annual contribution from the members. 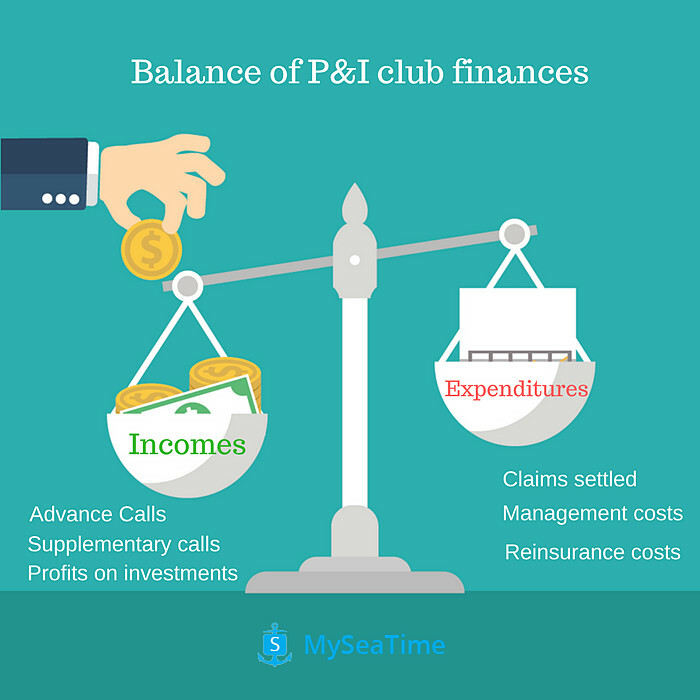 It is too obvious to say that P&I clubs will have many expenditures. The major chunk of which goes in the settlement of claims against its members. Apart from that, another expenditure of the P&I clubs is the management cost of running the club. Management cost would include the salaries of the employees and rent of the offices etc. P&I clubs also reinsure some of its risks. The cost of such reinsurance also comes under expenditures. Once the incomes and expenditures are known, the balances are just the game of addition and subtraction. At the end of the year, the amount short of the agreed amount to maintain in the fund is contributed by each ship owner. The contribution paid by a ship owner is equal to the “call rate” multiplied by the total gross tonnage of his ships insured by the P&I club. The call rate would be different for different owners and for different ships. I know we don’t hear this terms quite often. But there is this group of P&I clubs that plays an important role in the third party claim insurance. This is the group of 13 P&I clubs. All these P&I clubs are bound by the agreement called “International Group Agreement“. So any claim that exceeds USD 10 million, the excess amount will be shared by the member clubs of this group. As this is a huge group, it allows the group to economically share the large claims. 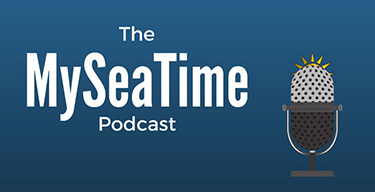 It is not uncommon for the seafarers to deal with P&I club correspondents. When there is a claim or an incident, we are asked to call for the attendance of P&I club representative. If we know how the P&I club functions and more importantly that they are on our side, dealing with these situations becomes easy. This makes the knowledge about the functioning of P&I clubs so much important. Capt. Rajeev Jassal has sailed for over 19 years mainly on crude oil, product and chemical tankers. He holds MBA in shipping & Logistics degree from London. He has done extensive research on quantitatively measuring Safety culture onboard and safety climate ashore which he believes is the most important element for safer shipping. Respected SIr, Very use full article . Following are the areas were there is confusion who will pay for these cases P&I or H&M , : Piracy , General Average (some say P&i and other H&M), contact with Jetty,pier,other installation, Delays and Fines by authorities. H&M is the insurance for the hull and machinery of the own vessel (except for collision cases where it pays for the 3/4th of the liability towards the other vessel). P&I is insurance for the claims from the third party. If you apply this to all situations, it should be clear. For example contact with jetty, if it involves repairing of the own vessel that would be from H&M but if the port claims for the damage to the pier, that would be covered under P&I. Hope that clarifies. Dear sir, well explained and easy to understand. Thanking you! Dear sir, if a ship hits a fishing vessel and loss of life of fishermens, then who will contribute for the loss and wat s the limit. thanking you. As this will be a third party claim, P&I club will pay on behalf of the shipowner. There is no limit of liability in these cases. The fishermen's family would file the criminal case and shipowner and seafarers involved need to contest that. Great information Sir. Request you to kindly answer my query.. Why Marine insurance is called Marine insurance Act? That is because, like any other type of insurance, marine insurance too need a law (Act) to govern it. For example, if there is no law, the insurer may simply deny the claims made to him by the assured. Or the assured may not disclose the true picture and still claim the huge money from the insurer. Sir, Can you explain 4/4 Rdc and LLMC 1976 and liability settlement-single liability settlement and cross liability settlement I.e difference between two? I have been an Insurance Manager for a shipping company of 10 vessels for more than 5 years. I have never seen such matters explained in such a simple and comprehensive way for those needing to know the basics (you even had a small / simple adjustment as a example!). Presenting these matters is such a way, shows solid knowledge on the specific topic and the kindness to share it with the shipping community. Congratulations from a fan from Greece! Found your blog. Its really valuable for worldwide shipping services. I appreciate your article. Its important for ge good informations on worldwide shipping services. So thanks for sharing all that important information. What happens when a vessel owner is involved in an offshore incident such as an engine room fire that eventually caused an oil spill due to delayed responders and US government agency deems the vessel owner as not being compliant with US federal laws which subject the vessel owner to unlimited liability. Will the P&I club pay out the claim or will it be denied? Does a charterer need to secure its own P&I if the ship already has P&I. I am worried about dock suing the charterer if the vessel damages the dock. No, charterers will not be responsible for this and hence no claim can be made against the charterers. The claim will be for ship owners or ship manager. The P&I insurance taken by them would be enough for that. Sir can you please explain relationship of P&I insurance and GA with any example? Dear Captain, your explanation is fully noted. However, i am a little bit confused on one thing. The first instance, you said that P&I clubs works on a non-profit basis but at the second you said that the Club will earn the income from the invested fund. The first and second statement sounds inconsistent, could you please clarify? your response will be highly appreciated. Even when P&I club earns the income by investing the money, the profit is one way shared by the ship owners itself as it reduces their premium. Dear sir, what is protection and what is indemnity? Can explain in details. hello sir, May I know what is the validity of the Certificate of entry ? Certificate of entry is generally valid until 20th of Feb. So the Validity is one year if it is issued 20th Feb and less than one year of issued after 20th Feb (such as in case of a new ship or change of P&I club). Brilliant explanations with ease of language. It cleared so many doubts. Sir, Why only 3/4 th is paid by the H & M not 100%..and if 3/4th is paid by the H&M than who will pay remaining 1/4.Shipowner or P/I. and if shipowner dont have that much money to pay.than who will pay and in that case if p/i pay than why will he pay???? Your this particular article is very useful for me. Thanks for all these valuable information.